James Morton at Kaeside Farm. A long-running dispute between neighbours led to a farmer driving an agricultural digger towards a university professor, Selkirk Sheriff Court has been told. James Morton then got involved in a violent struggle with police in a cow shed, resulting in one of the officers falling into an animal waste pit. Details of that confrontation and disturbance emerged as the 37-year-old was fined £540 after admitting threatening or abusive behaviour. 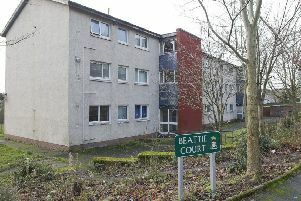 Graham Fraser, prosecuting, explained that there had been long-standing ill feeling between the farm at Kaeside, south of Tweedbank, and one of its neighbours, Britta Kalkreuter, a professor at the school of textiles and design at Heriot-Watt University’s Galashiels campus, and her husband. At lunchtime on November 22, she heard a banging noise outside her home and went out with an iPad for filming purposes to investigate. Once outside, she saw Morton in a digger with a bucket in front excavating earth, but upon spotting his neighbour, he stopped what he was doing and drove at a steady speed towards her. The police were contacted, but Morton refused to speak to the officers when they arrived. The officers then viewed the video footage on Dr Kalkreuter’s iPad and took a view that Morton’s actions were a deliberate attempt to intimidate his neighbour. Mr Fraser said Morton then ran off into the cow shed, and a violent struggle with the officers ensued, resulting in one of them falling into animal excrement stored in the shed. After being cautioned and charged, Morton insisted Dr Kalkreuter was at fault, saying she should have moved out of the way of the digger. Defence lawyer Mat Patrick said his client should be given a degree of sympathy as he had been engaging with the Scottish Environmental Protection Agency and had spent thousands of pounds trying to rectify drainage problems locally. He claimed that Dr Kalkreuter and her husband had reported the farm to the agency on three occasions and to the Scottish Society for the Prevention of Cruelty to Animals four times. Mr Patrick added: “It has been going on for some time, and he was at the end of his tether. He felt it was a vendetta when he saw her holding the iPad, and that it was being done to provoke him. He explained that the incident with the police arose because Morton had panicked. Morton had a fine of £600 imposed by sheriff Adrian Cotham reduced to £540 due to his guilty plea. It was noted that Morton had a previous related conviction.